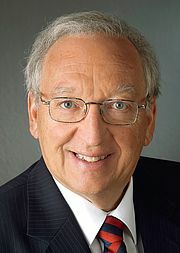 In 1995 in conjunction with a brainstorming event of the Ministry of Research, Prof. Eberhart Zrenner, the former Director of the Institute for Ophthalmic Research,now Senior Professor at the Werner Reichard Center for Integrative Neurocsiences in Tübingen, Germany pursued the idea to use electronic implants under the retina to replace natural photoreceptors by technical photoreceptors aiming to help blind retinitis pigmentosa patients. He had run since 1975 special clinics to investigate hereditary retinal dystrophies and had established a special clinic when he became full professor at the University Eye Hospital in Tübingen in 1989. The question driving him was simply: "Is it really true that we cannot help patients who are getting blind in young years from hereditary retinal degeneration?" Due to favorable circumstances a team of engineer, biologists, surgeons in and around Tübingen could be motivated to form a team that in 1995 forwarded a proposal for subretinal photosensitive array with many little photodiodes amplifiers and electrodes, to be implanted under the retina in order to use light falling onto the retina to stimulate the remaining neurons of the inner retina. The proposal was granted by the BMBF and during the following ten years more than 6 million Euros were given in several grants to this "SUBRET-Consortium" at Tübingen University, at the Natural Medical Institute in Reutlingen, the Institute for Microelectronics in Stuttgart and the University in Regensburg in order to further pursue this idea, considered by many scientists that time as "quite crazy". Eight years of intensive research in terms of material, electronic circuitry, surgical technique, biocompatibility and biostability followed as well as in vivo experiments in rats, rabbits, cats and pigs in order to show that it is possible with subretinals implants to stimulate the retina so that cortical responses can be recorded. In parallel the basic knowledge about how much current is required to stimulate the cells and how much current is too much was developed under the guidance of Dr. Stett from the NMI and the circuit to achieve those values had been devised by Dres. Höfflinger and Graf from the IMS in Stuttgart. A series of surgical new approaches in the subretinal approach was developed by Dres. Gabel, Sachs and Kobuch and finally it was proven with cooperation partners in Marburg and in Bochum that spatally resolved signals do arrive at the primary cortex of the cat. So the preclinical proof of concept had been achieved in 2003. Unfortunately funding from that time on, according to European rules, was possible only to 50% and the request of the BMBF was to come up with 50% of private funds in order to continue the support from federal funds. Initially no partners from industry could be found and after vain endeavor to motivate big strategic partners in the field the small company of Retina Implant AG was founded in Reutlingen near Tübingen. With the help of local entrepreneurs small funds could be found to start the company and it was a happy coincidence that Dr. Walter-G. Wrobel, CTO of Carl Zeiss Meditec AG, joinedthe company as CEO and could recruit Reinhard Rubow, with years of professional experience at Capgemini and at NMI, as Chief Financial Officer. They were able to secure funds from business angels to develop a device that could get a permit y from the authorities and the Ethics Committee tob e used in a first clinical study. In a first pilot study with eleven pioneer patients with a cable bound implant all the principle prerequisites could be established that allowed to determine the proper values of electrical stimulation, power supply, dimension and surgical procedures that made a main study feasible. It was patient no. 11 (after 15 years of blindness) the last patient of the pilot study who first time with an implant that was put exactly under the foveal region, was able to recognize unknown objects, to read letters, even to detect spelling errors, to see persons at distance and to achieve a visual acuity of Peterson 20/1000 which is the border of going from blind to low vision. The success which was achieved with a subretinal implant with 1500 pixel chip that opened a square shaped window of 15°visual field across corners was a big motivation to go on. Retina Implant AG in the meantime had developed a wireless version which then in the main study was implanted in Tübingen in further nine patients in the first phase of the main study. These patients now were able to take the implant home to adjust contrast and sensitivity of vision themselves and they reported very happy experiences, seeing faces, facial expression, flowers, letter, street lamps, cars and especially at home to see and differenciate objects on the table like cup and knife and plate and to find unknown objects of certain shapes, like banana, apple etc. A maximum visual acuity was reached up to 20/550 – the best reported so far with any approach of this kind - and these results were presented at several meetings and published in several papers (Wilke R, Gabel V-P, Sachs H, Bartz Schmidt K-U, Gekeler F, Besch D, Szurman P, Stett A, Wilhelm B, Peters T, Harscher A, Greppmaier U, Kibbel S, Benav H, Bruckmann A, Stingl K, Kusnyerik A and Zrenner E: Spatial Resolution and Perception of Patterns Mediated by a Subretinal16-Electrode Array in Patients Blinded by Hereditary Retinal Dystrophies; Investigative Ophthalmology & Visual Science, July 2011, Vol. 52, No. 8; Zrenner E, Bartz-Schmidt KU, Benav H, Besch D, Bruckmann A, Gabel V-P, Gekeler F, Greppmaier U, Harscher A, Kibbel S, Koch J, Kusnyerik A, Peters T, Stingl K, Sachs H, Stett A, Szurman P, Wilhelm B and Wilke R: Subretinal electronic Chips allow blind patients to read letters and combine them to words. Proc. R. Soc. 6 2011 278, 1489-1497. Moreover the possibilities that patients can use eye movements to localize objects and that there is no camera outside the body and the whole implant is invisible to the outside world makes this approach very attractive to patients. In the meantime other institutions have joined the clinical study and surgeons had been trained during the monophasic study in Tübingen. In the meantime further patients had been successfully operated in Oxford, London and Hongkong Budapest, Kiel, Dresden and Singapore. (Coordinating investigator Prof. Zrenner). In 2013 the Retina Implant Alpha IMS got the CE mark for a product that can be marketed;in the meantime data are available from altogether 29 patients. Of course further developments are necessary in order to maximize long term stability, spatial resolution and contrast, but proof of principle has been achieved in the meantime that the subretinal approach developed by the Subret Consortium and continued by Retina Implant AG is feasible to help patients blind from hereditary retinal degeneration. Of course the particular construct which is unique in Germany that a University Eye Hospital and a full fletched research institute, the Institute for Ophthalmic Research, (of which Prof. Zrenner had become founding director) with altogether nine fulltime life professorships are closely working together very much supported the transition from the idea to the laboratory experiments into a clinical study. It is this unique setting which allows - as hopefully will be shown - in many other instances in the future - that basic science ideas through the chain of preclinical work and clinical studies with the help of the clinical study center eye trial at the University Eye Hospital and with the help of the research oriented clinicians in Tübingen will create many more applications that go from benchside to bed. Last but not least the continuous communications between basic scientists and clinicians is very important in order to make the scientific partners aware of the necessities limitations but also chances were basic science has good possibilities to translate its know-how to the development of products for new therapeutic strategies.